Meet Ben Westerik, a local from Nelson BC. He loves that he can walk out his door and hop on his bike and either start peddling uphill and be on world-class mountain bike trails right on the edge of town, or I can whizz downtown in minutes and be surrounded by a plethora of coffee shops, craft brewery options, and more restaurant menu items than he can ever possibly hope to try. Check out his Instagram Feed to see more of his work! #1 - Describe your perfect day in the Kootenays? My dream has always been to have an empty ski resort with a massive dump of snow and just you and your friends to ski it all. That dream did in fact come true last April on Whitewater's incredible 50+cm closing day. The access road was experiencing major delays and I managed to be amongst the lucky few to arrive early. The sun came out and we skied the best snow of our lives until the chairs finally came to a stop, the season came to an end, and the day concluded with a tailgate barbecue in the parking lot followed by craft beers in town. I can't really imagine anything better. #2 - What is an experience that you would suggest to a new visitor to the Kootenays? One thing I love about exploring in the West Kootenay Region where I live, is that this isn’t Banff or Jasper, it isn’t the Sea-to-Sky region - if you don’t see another soul on the road getting to where you’re going, it doesn’t mean you’re going the wrong way, to me it means you’re headed in the right direction. To really experience this area, I recommend getting a ‘Kootenay Rockies backroads mapbook’, hitting the dirt roads and learn to not be afraid of a few rocks or steep switchbacks and trailheads that don’t always have the greatest signage in the world, if you’ve come looking for an adventure, you’ll find it here. One of my favourite experiences lately has been hunting down historic fire lookouts. You won’t find them in many travel brochures so they might take a little bit of an adventure to find, but they’re always placed in areas of prominence with a commanding view of the regions around them, so you’re guaranteed some fantastic scenery as well as an interesting little cabin to discover. 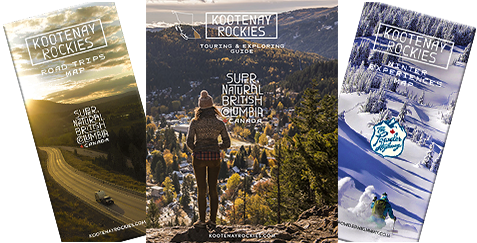 Some of the most popular ones in the area are Buchanan over Kaslo, Idaho Peak above New Denver, and Old Glory by Rossland, the latter is definitely my favourite. #3 - Who is your favourite outdoor companion? Pretty much anyone that's willing to go on an adventure with me is. One thing I love about adventuring around with different people is how everyone always brings a different perspective to the great outdoors and gets stoked on different things that they see. For some it's the trees, for some it's the shapes of the mountains, for others it's the birds, the colourful mushrooms, a strange flower, the leaves on the trees, the leaves on the ground. Everyone gets stoked off a myraid of different wonders and it’s always fun to see the outdoors from someone else’s perspective. #4 - How does the Kootenay wilderness inspire you? I’ve been hiking in various parts of the world, and there’s nothing like the vast wilderness spaces that we have right here in British Columbia. The shear number of possible adventures you can have right in our backyard almost overwhelms me sometimes, my adventure checklist is just so long. I feel inspired to get after it in the mountains every morning when I wake up and I’ll never count time spent active in the great outdoors as wasted time. The more time I spend outside, the more inspired I am to just keep right on exploring, sometimes I’m in the middle of one adventure just dreaming up new ones to go on as soon as I’m done! #5 - If you could choose one spot in the Kootenays that make you the happiest, where would it be? I absolutely love living in Nelson, it has a vibe unlike any other place I've ever lived; there’s a totally unique mountain culture here and people are very spiritually connected to this place. I love that I can walk out my door and hop on my bike and either start peddling uphill and be on world class mountain bike trails right on the edge of town, or I can whizz downtown in minutes and be surrounded by a plethora of coffee shops, craft brewery options, and more restaurant menu items than I can ever possibly hope to try. Keep on biking and I can find myself lying on a beach or reading a book under a shady tree in the waterfront park. Fast forward to winter and it’s a short daily commute up to some of the best powder skiing in the world (although I’m not sure I’m supposed to be spreading that news around)! Sometimes I stop and wonder, how is this real life? All responses and images by Ben Westerik.